Mobil 1 Sussex Racing is the Formula Student team at the University of Sussex. In recent years it has surged in popularity, consisting of a diverse combination of 2nd, 3rd and 4th-year Automotive, Mechanical and Electronic Engineers, as well as a small team of Product Designers and Computer Scientists. 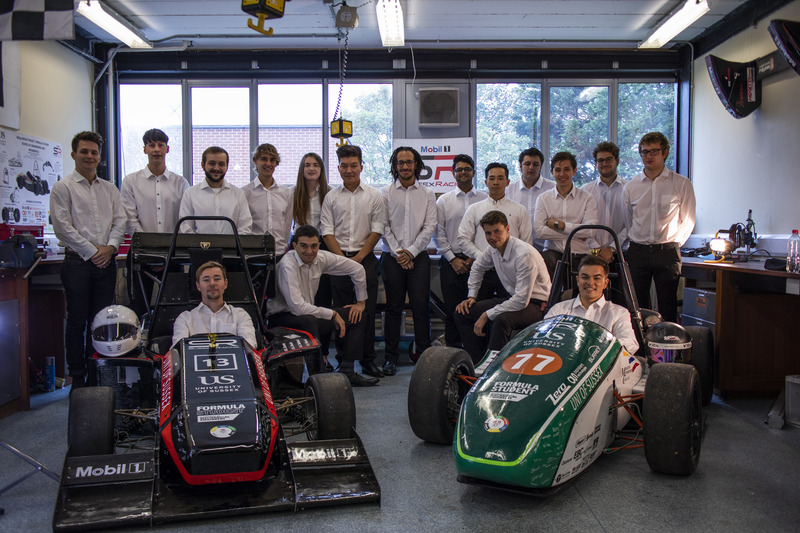 This year we have 18 team members, including Mechanical, Electrical and Automotive engineers. Formula Student 2018 saw the best car Sussex Racing has ever built, with a 22nd overall finish and a coming 13th in the UK out of 81 entrants! In 2015 the team managed to get into the Top 10 in the UK at Silverstone and 28th overall. In 2016 the team again secured a place within the Top 10 in the UK, and also winning the Class 1 Business Presentation out of 105 Universities worldwide. Then in 2017 the team were hampered by a braking issue which meant they were unable to compete in any dynamic events, however, they were still able to obtain a Top 25 finish in the UK and 40th overall. Mobil 1 Sussex Racing also entered a Class 2 team for the fourth year running with the 2017 team finishing 11th in the UK and 16th Overall. Class 2 consists of Year 3 students creating a concept Class 1 car, with members then proceeding into Class 1 for the following year. Mobil 1 Sussex Racing have recently changed their supporting charity and are now proud to support the JBVC Foundation, who help get young people out of gang culture and into sustainable careers. We actively promote the charity and help raise awareness of engineering careers and a percentage of all donations received from fundraisers are passed onto the charity. The NoseCone Club was created to allow supporters to have their signature on the front of the car, all for a small donation. In 2017, before our charity change, Mobil 1 Sussex Racing raised £851 for Help for Heroes with the help of Santander Universities.